When things go wrong, you’re going to need a back up.. Veteran motorbike riders are well aware of the fact that it’s not a matter of if you have an accident, but when. For this reason it’s worth investing in the best protective gear possible. 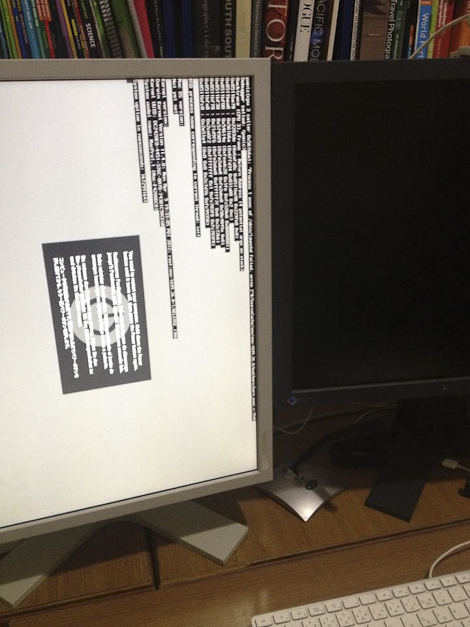 Experienced computer users will likewise tell you that it’s not a matter of if your hard disk drive will fail, but when. And it’s not just hard drives, almost any kind of digital data storage device can become unreadable. This includes CDRs, DVDRs, Blu-rays, Solid State Drives and even the optimistically named Secure Digital (S.D.) cards. People treasure their pictures. As the forest fire approaches or flood waters rise, it’s wedding albums and family photographs that are saved not plasma televisions and golf clubs. Unfortunately, in this digital era, many people have their images stored on a home computer and when it dies, they’ve lost months or years worth of memories. Data recovery services are an option, and I know of several photographers who have paid thousands of dollars in fees to companies that were able to get back a portion of their images from a particular drive or card. Not surprisingly, computer companies and particularly drive manufacturers don’t advertise the fact that the two hundred or even two thousand dollar piece of hardware you’re buying will fail spectacularly at some point in the not too distant future. Of course, it’s recommended in the fine print to back up drives, but they’re hardly going to put data health warnings on the outside of the box. Which brings me on to Data Asset Management, or in layman’s terms, backing up all your stuff. The fundamental principle of data asset management is having multiple copies of all your data. When discussing redundancy I believe the U.S. military have a phrase “Two is one, and one is none.” Tech gurus take this another step saying that there must be at least three copies of all data, ideally in at least two different locations. There are many ways to protect your data, but I’ll start by explaining my current system. The first backup is done while shooting. 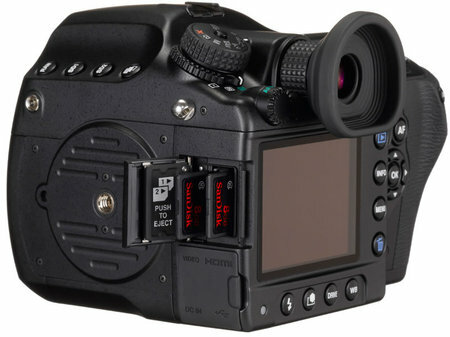 Some cameras now come with dual card slots. You can set these up so that the image is recorded to both slots. If one card fails catastrophically as you are transferring the images (computer struck by lightning) or you drop it down a drain, you’ve still got a backup. Once the files are on your computer your next step is to have them backed up to an external hard drive. Apple have made backing up data an integral part of their operating system with Time Machine. You can do this wirelessly with an Apple Time Capsule, but as I use a desktop it’s just as easy and cheaper to use any large wired external hard disc. Time Machine automatically backs up all the data on my computer to a 3TB external hard drive. When an internal hard disk failed I was able (once I got a replacement) to restore the drive from Time Machine. 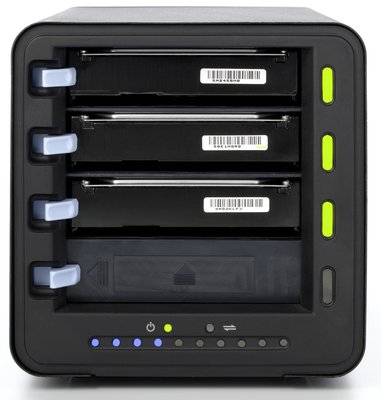 Drobo – built in redundancy across multiple hard drives. Another popular option used by several of my friends is a Drobo . (Ironically Drobo means robber in Japanese). It works by making multiple copies of your data across several hard drives so that there is always redundancy. If I was working off a laptop and not storing data on the desktop I’d definitely consider getting a Drobo. They’re not cheap, but they come highly recommended. The next step is to have an offsite backup. The backup drives sitting next to your computer won’t save your data if they are simultaneously burned, submerged or stolen. All my image files (and my iTunes data) are also saved to external hard disks which are stored elsewhere. All my other data is in a 100GB Dropbox account on the web which I can access from anywhere. At some point in the future I may backup all my data to the cloud using Dropbox or another service like Amazon Glacier or Crashplan. In summary, equipment fails so you need to have a backup. Don’t cross your fingers and presume it won’t happen to you, because it will. And just in case the world is hit by an electromagnetic pulse weapon, it’s probably worthwhile making a few prints too. Nice article. I backup all my photos onto another hard drive every week, as well as doing a system backup. Plus I backup my Lightroom catalog onto my Google Drive every week on a schedule too. Once I get my small computer working as a cloud server I’ll do double backups of critical data there too. My music is all online with Google Play Music so that’s safe in the event of a crash. Some good ideas for people. Always use some sort of protection guys and gals. Don’t want to get caught out.